Hey, I'm trying to figure out how I should import an external class. I assume it is done via the classloader which worked, but the issue I have is that this class requires a lot of other classes and the list is nearly endless. I wrote a small php script which works fine, but as soon as I try to implement it into phalcon it fails with missing classes. This php code works fine when run alone. But when I add it to a Controller and add the "Autoloader.php" to the Phalcon loader (which works) it doesn't load the other required classes (e.g. Xenforo/Application, Zend/Controller/Request/Http, Zend/Registry). What is the best way to get this working? Im not clearly getting your problem. Can you push your code? I created this small php script to get the session data from xenforo. It works fine and when I use it in another non mvc php script it works fine. But as soon as I try to use it with phalcon it doesn't include the required classes. e.g. XenForo_Autoloader, XenForo_Application.. I tried that already. After the 22th class I added to import I gave up.. Do I really need to add all files that Autoloader and later on the other classes require? If you want the one from xenforo, too. 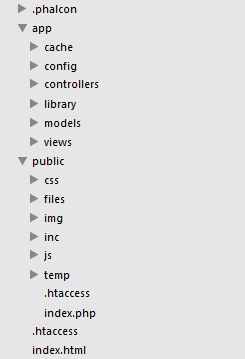 Than I need to look for a command line directory tree generator.